World Bank president Paul Wolfowitz is to resign at the end of June. He had come under fire for allegedly breaking bank rules to arrange a promotion for his girlfriend. His announced resignation prompted reactions from both supporters and critics. "At the same time, it is clear from this material that a number of mistakes were made by a number of individuals in handling the matter under consideration, and that the bank's systems did not prove robust to the strain under which they were placed." 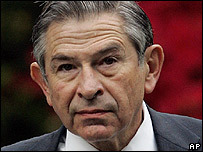 "Paul Wolfowitz is a good man who is passionate about the plight of poor people in the world. "We would have preferred that he stay at the Bank, but the president [George W Bush] reluctantly accepts his decision." "It's about time. I called for Paul Wolfowitz's resignation a month ago when it became clear that his leadership was undermining America's ability to lead the fight against global poverty. "Wolfowitz's tenure at the World Bank was marked by serious questions of financial integrity that alarmed our allies." "While Mr Wolfowitz has finally done the necessary thing by resigning, he has damaged the institution, and continues to damage it every day he remains as its president. He cannot continue to be the face of the World Bank. "He has demeaned the Bank, insulted the staff, diminished its clients, and dragged this institution through the mud. He has put his own interests before those of the institution. "In making a statement of gratitude to Mr Wolfowitz, the Board has done the same. They have attempted to save his face, and in so doing have destroyed that of the institution they are entrusted to protect." "I am relieved that this damaging time for the Bank is finally over. I acknowledge the achievements of the Bank over the past two years. The bank's task now is to renew its efforts to lift people out of poverty. The UK remains a steadfast supporter of the bank, and its staff, as a force for good in the world." "Wolfowitz's resignation shows that even the office of the president has to play by the rules. "The US and other rich countries must now show that they are serious about good governance by allowing the next head of the Bank to be appointed based on merit through an open accountable process." "There is growing discomfort with this idea that the United States should hand pick the World Bank president with no consultation."